Guess I was a bit disappointed when comparing the cost of a Viking cruise compared to other cruise lines. Service other than the dining room is second to none! We have always wanted to see the New England fall colors, we choose this cruise line mainly because it was so highly rated by CruiseCritics. Our disappointment was two-fold. First, we did not see much fall color on our trip. In most places we visited, we were told the fall color is very late this year. Secondly, on the Viking line itself, while the ship and stateroom were top of the line, the free cruise tours left much to be desired. Value wise, we did not feel Viking delivered. Viking, as usual, delivered great service that exceeded expectations. The ship Viking Sea was, like all others, beautifully decorated; the colors are warm and furniture high end leather and fabric. The staff, as usual was superb, meeting every need. This was our first Viking cruise and we were blown away. The ship was never crowded and the staff simply superb. Can’t wait to do it again. I was initially concerned I would get bored on this cruise, but I was pleasantly surprised. Lots to do and see. This was an excellent cruise. The ship, crew, food and ports were all that could be desired. Weather didn't always cooperate but what do you expect on a North Sea cruise. Our cabin was the best and everything we asked of the crew was provided promptly and warmly. The food could not be topped anywhere--on land or at sea. Viking did not disappoint. Beautiful ship with very attentive and friendly staff. Amazing itinerary with bucket list ports. The Viking settlement in L'Anse aux Meadows was an excellent choice of ports after following possible routes the Vikings may have traveled. My favorite part of the cruise was probably the ship itself. The crew and the entertainment were great. The food was good everywhere - who could complain with sushi and crablegs on the buffet every single night. Some of the tours were not up to expectations - especially The Hermitage in St. Petersburg. Not sure where they took us but it was NOT the main part of the Hermitage and was extremely disappointing. A few of the tours had no free time for shopping or exploring on your own and some were a little unorganized. Overall the cruise was wonderful, but I would not recommend it to anyone under the age of 60. The average age was older than I expected. My favorite part was being able to see and do so many things in so many countries. Favorite excursions included light house tour in Denmark, kayaking in Norway, Hermitage Museum Impressionist art in St. Petersburg, and cycling in Estonia. I would not recommend the Famous Helsinki Ice Bar in Helsinki. The service on the ship was phenomenal! It never felt like there were 900 people on board. There is plenty of space for relaxing alone-- it never felt crowded. Excursions were well planned. I would definitely recommend Viking. The ship was nice and the food was some of the best we have ever had on any cruise. Stockhom was a lot of fun and what a gem the Rostock Germany was, it was very nice. The Viking Ocean Cruise Line has beautiful ships and very nice cabins. We have stayed in an Explorer Suite on two trips on two different ships. This cabin is much more space than we need, but the views are outstanding, so we spring for the luxury. In addition the walk-in closet makes the space feel like home instead of a temporary stay. One item to note for the Explorer Suites on the 3rd floor bow, there is a good deal of noise. In the evening/night you can hear music coming from the Star Theater below and when docking (which is often in the early morning) you can hear all the winches moving below. If you go with an Explorer Suite, other location choices may be better. The service on board the ship is top notch. Despite the long hours worked by the housekeeping and restaurant staff, they genuinely seem anxious to please. I can not think of a request that was not granted. In addition, they did a great job of anticipating requests; therefore there was actually little to ask for. Having said this, one service area on the ship could use some improvement. This area is Excursion Staff. We found if we wanted to do something that was different from their established schedules, they were resistant and not terribly helpful. Often they would answer a question before I had completed explaining what I needed and thus didn't even understand the request. It seemed like their role was to get us into their specific excursions and were not open to anything else. This inflexibility actually caused us to book fewer excursions than we had wanted to. 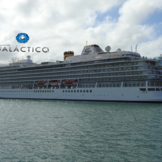 Since this was our second ocean cruise with Viking, I was able to compare the two ships and trips. Both ships are very similar; however I did find small things missing from the second trip (Viking Sea) that made the trip on the Viking Star just a notch above. Some of these small things were hot towels that were offered upon return from each excursion, antibacterial hand wipes handed out on all bus trips, cocktails of the day listed in the Viking Daily news, and the frequent presence of the captain and cruise director among passengers. One final note for improvement is the folks who answer the phones in Los Angeles. I was given incorrect information on more than one occasion and more than once when I needed help with information or the operation of the website, the customer service department either did not respond at all or responded incorrectly. It has given me the impression that once the sale is made, the employees no longer are invested in helping. Perhaps this is a reflection of how pay incentives work. I don't really know why this occurs, but I experienced this type of problem with each cruise. Despite these complaints, we were very satisfied with the trip and would absolutely recommend Viking Ocean cruises as well as this specific itinerary. We enjoyed the trip enough, that we have already put a deposit on a Viking River cruise. This cruise from Venice to Barcelona was out fourth trip with Viking but our first sea cruise. We are planning to take another one. The ship has less than 1000 passengers but there are still plenty of things to do on board and great entertainment. Several tours were offered at every port. And the food on board was fantastic. The ship is new, the staff is fantastic, and the ports of call were all remarkable. Love the included tours. The Viking Sea and it's staff are out to make your cruise as perfect as it can be. I highly recommend Viking Sea to anyone interested a perfect sea cruise. This cruise on the new ship Viking Sea had the benefit of beautiful weather (in contrast to the immediately preceding ones which had bad problems)...so we were lucky. The cruise went to some fairly untypical ports which were all interesting. Viking had free excursions at all ports - some were good others not so much. The food was above average although we had a disappointing meal at the specialty restaurant Chef's Table. The best part of the cruise was the crew who were all extremely gracious. I would certainly recommend this trip to others. Food and service excellent. The best employee the have is Heather Clancy. The ship is beautiful, clean and has a lovely group of entertainers. Loved the full screen movies at the pool. Favorite: From an informational standpoint, the Port Talks and Lectures were absolutely wonderful! It provided everything you needed to know to get the most out of each port. As far as the ports go...hard to say which was a favorite. Dubrovnik really stands out as we had a chance to walk the city walls in almost solitude. It was magnificent!!! We took an underground city tour in Naples on our own...you should include this as an option...it was fantastic!!! Improvements: The Viking Sea was a great experience. The only area of improvement was room service. Our steward, Adonis, was great...but the in room dining was less than spectacular. Rarely was the order correct at breakfast and once our dinner was not even delivered. This was after an extremely long day in Rome and the on board restaurants were closed. Other than the in room dining...everything else was impeccable.